Home / Editor's Choice, Entertainment News, Featured Articles, Gossip and Drama, News, Politics, Videos / See how this bride entered her wedding, the lady is naughty, Did the husband marry a STRIPPER? (VIDEO). See how this bride entered her wedding, the lady is naughty, Did the husband marry a STRIPPER? (VIDEO). 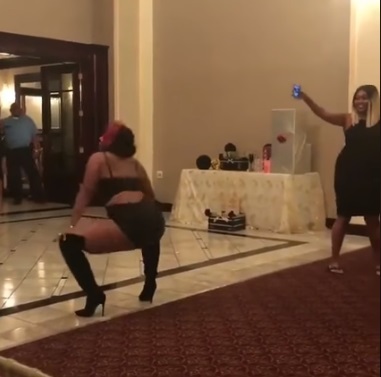 Saturday, September 1, 2018 - This lady left tongues wagging during her wedding after she made a grand entrance dressed like a stripper. She wanted to break the norm and do something crazy that her friends will remember forever. She pulled some crazy dance moves in front of friends and other invited guests and they cheered her on. This world is really becoming crazy.